Go to YouTube and type in “vaporwave song” and you’ll end up on a page with a lot of Japanese characters and people commenting with spaces between every letter. You’ll see purple and blue and the Windows 98 logo. You’ll end up reading the word “aesthetic” over and over. You’ll probably decide that this is where you draw the line and log off. Vaporwave, though cocooned in irritating internet memes, is a gem of a genre. With a little guidance, anyone can learn to shovel through the garbage and find the treasures hidden within. Like many electronic sub-genres these days, vaporwave began life not as a style of music, but as an aesthetic, a set of ideas and creative principles guiding artists without any ties to a specific medium. Vaporwave exists simultaneously as photographic art, digital collage, graphic design, illustration, video and interactive art, with each exploration yielding similar-feeling results despite vast differences in method. This pursuit of a mood, rather than adherence to structures or instrumentation, gives musicians lots of breathing room. Let’s dive in. In 2009, a small collection of bizarre singles appeared on YouTube, droning through endlessly repeated samples of 80s songs. They were eventually compiled into an album titled Chuck Person’s Eccojams Vol. 1. Chuck Person was a one-shot pseudonym used by Daniel Lopatin, otherwise known as Oneohetrix Point Never, who continues to release music under that moniker. Eccojams Vol.1 is widely credited for beginning the vaporwave movement; though it was released without any context, listeners soon agreed that it felt like a retro-futuristic critique of capitalist culture, dripping with texture and mysteriously devoid of the cult of personality present in other indie genres. New artists soon emerged, each bringing their own take on this new style of musical recycling. Here’s a particularly famous example. 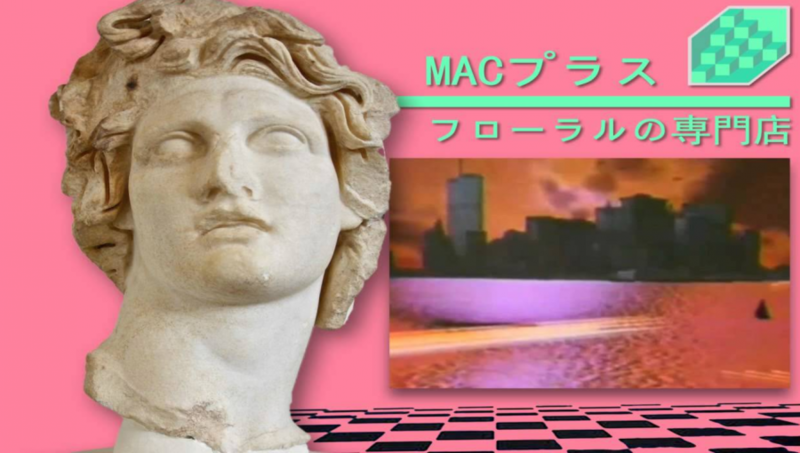 It wouldn’t be a vaporwave article unless someone brought up Macintosh Plus and her internet anthem “リサフランク420 / 現代のコンピュー” (Lisa Frank 420/Modern Computing), a reworking of Diana Ross’s “It’s Your Move” that became a meme as inescapable as any. As vaporwave matured, it began to escape the trappings of its original tropes. People realized that merely slowing down songs didn’t require too much effort, and soon the internet was inundated with sluggish versions of hundreds of songs. However, new artists started writing purely original music inspired by the same feeling, and suddenly the subgenre mutated in several directions at once. Artists like Blank Banshee, Saint Pepsi and 2814 each took vaporwave to wildly new places; Blank Banshee 1 is a cold, heavy tech-infused trap album bursting with AOL sound effects, while Saint Pepsi’s 2015 hit “Fiona Coyne” is a bouncy, sun-soaked pop song. 2814’s critically-acclaimed second album, 新しい日の誕生 (Birth of a New Day), is a slow, methodic drive through Blade Runner ambience and drone tones. The aesthetic hasn’t stopped evolving. As its meme grows bigger and bigger, it gradually begins to influence bigger and bigger artists, who each bring new interpretations of what vaporwave should sound like. Anamanaguchi, a band at the forefront of the chiptune movement, “leaked” a collection of 30 songs via an “unfinished” video game in early 2016 that are unmistakably influenced by its bizarre textures and ideas. The future of vaporwave is uncertain, which is perhaps fitting for a genre torn between the future and the past. It continues to grow, but carries with it the burden of millions of overwrought internet jokes; it continues to break new ground, but how far can a genre develop before becoming something new altogether? No one knows. But one thing is for certain: there will always be good music waiting deep within the web.